Learn Tulu Online : Part 7 - Learning through Tulu Songs, Movies and Celebrity Talks! Learning a language can be fun. Listening to songs, watching plays/movies of the particular language help us learn faster since in doing so we not only learn the tongue but also enjoy the performance. Also, one can learn the pronunciation of words and the accent. Isn't it the way we learnt Hindi apart from the lessons at school? Well, now I present to you clippings of some of the well known songs, movies and plays in Tulu. Hope you enjoy these videos and pick up Tulu quickly! Also, I would like to add the video of Aishwarya Rai speaking in her mother tongue Tulu, which should serve as an inspiration to those who want to learn Tulu! Translation : You can find the translation of the Dennana Dennana song in English here. Background : RangiTaranga was a blockbuster movie in Kannada in 2015, which had a Tulu song, Dennana Dennana, which became very popular. Here's the video of Dennana Dennana song from RangiTaranga! Song : Pakkilu Mooji onje goodudu badukonduge. Background : This song depicts the happy family of 3 birds in a nest. The younger one is acquiring wings and family is leading a happy life. Rest of the song is about the conversation between husband and wife regarding their child. Here's Kannada singer B R Chaya and Ravishankar singing Pakkilu Mooji onje goodudu badukonduge. Aishwarya Rai speaking in Tulu : Following is the video of Aishwarya Rai, former Miss World and popular Bollywoord actress, speaking in Tulu at Kannada Rajyotsava function in Mumbai on November 14, 2007. Here is the translation of what Aishwarya Rai spoke in Tulu on that day - "Thank you all for welcoming me with your love and affection. I could not attend this function all these years because of my busy schedules. This year, organizers had informed my father about the function, 4 months in advance. I thought this is the best occasion to attend along with my husband. Definitely this programme would have been recorded. I would carry a cassette / CD of this function and show it to my husband. He was telling how children gave a good cultural programme today, showcasing our culture." Suniel Shetty : Popular Bollywood action hero, who was born in Mulki near Mangalore, spoke in Tulu when he came to Vishwa Tulu Sammelano(World Tulu Convention) in 2009. Here is the translation of what Suniel Shetty spoke when he came to Ujire - "Whoever is present here is part of my family. My fellow Tuluvas, I am very happy to come here and see all the arrangements (in this grand function). You have put in a lot of efforts under the leadership of Anna (Dharmashree Veerendra Heggade, head of Dharmasthala temple trust) and done a wonderful job. I feel that this work should have been done long ago! But I am very happy today seeing this. Nobody is there anywhere who puts in efforts like we do. We have established ourselves in whichever part of the world we have gone. But we have not ignored our language! 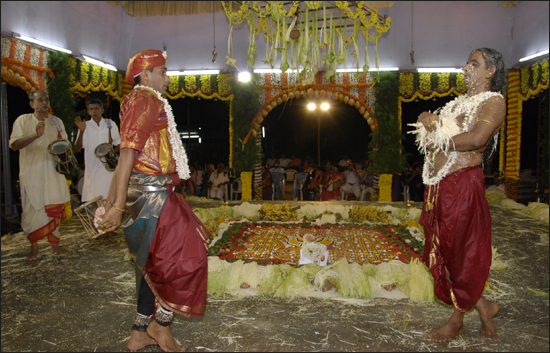 We should come to our native(Tulu Nadu) every year twice or thrice and celebrate our culture! Shilpa Shetty : Shilpa Shetty visited her native near Mangalore after marriage. Here is the translation of what Shilpa Shetty spoke to media persons that day - "I wanted to come to my native place to seek blessings but I could not come immediately after my marriage. But I have come now after making time amidst my busy schedule. Also, my mom used to tell that we need to visit our native place from a long time. So, we came here. We visited our places of worship - Nagasthala, Bhuta Sthanas (of Jaarendaya, Mesandaya, Sathyavathi, Anna Panjurli). We visited Kateel temple before coming here." Then the media person asked 'What is special about Kateel Temple?' for which Shilpa Shetty replied - "I believe a lot in Goddess of Kateel temple (Sri Durgaparameshwari). My grand mother(doDDa) used to believe too. So, I have continued that! Even I have a photo of the Goddess in my pooja room (in Mumbai). Culture of Mangalore is deep-rooted in me and I continue to follow that. Then she said "My husband accompanies me in these visits. He has no choice but to come with me and even he is very religious." Shilpa had visited during the time of Cricket World Cup in 2011. So she was asked by the reporters to predict the winner of the cricket world cup! For that, Shilpa answered saying Firstly, India need to win the semi-finals against Pakistan. It is not my prediction but my wish! What else - if India wins the world cup everyone is happy. Even I pray for that to happen! Incidentally, India won the world cup in 2011 and made everyone happy! Ee Daane Mulu, Yeregavuye Kirikiri : This is the popular dialogue from the 2015 Tulu movie, Ekka Saka, which is creating a buzz these days in social media. Translation of the phrase is 'Why are you here? (ee daane mulu). Who would want that trouble/nuisance? (yeregavuye kirikiri). To find out more about this phrase, please click here. Conductor Training School : Now its time for some comedy! Private buses are the life line of people of Mangalore. Following clipping shows a 'conductor training school', where a bus conductor demonstrates how he will attract the passengers by telling the names of the places where the bus will stop. Its really funny, enjoy watching the video! Where are part 5 n 6? awesome Ravish! Your doing a great job!